Note: This event is dependent on the time of sunset and thus begins strictly on time. No film will be projected at this event. Evening, July 25, 1964, Manhattan. From an office on the 41st floor of the Time-Life Building, Andy Warhol and friends pointed a film camera out the window across the New York sky, at a splendid view of the Empire State Building. As he began filming, the sun set, the sky darkened, and the building’s dramatic floodlights came on. For the next six or so hours, he loaded reel after reel in the camera. 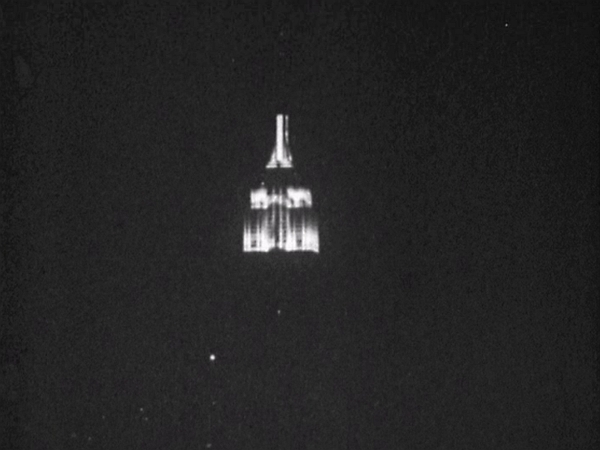 Just before 2 am, the floodlights went out, and Warhol kept the camera running, filming the darkness. The ten reels made that night, completed only in the process of slow-motion projection and lasting eight hours in whole, have endured as one of cinema’s most notorious legends: often mentioned, rarely seen, this is Empire. On Friday, July 25, 2014, Film Love marks the fiftieth anniversary of Empire's making with a special event – our first at Mint Gallery and the first part of "Fifty Years of Empire," a series of upcoming events on the occasion of the film’s anniversary. This event is also the latest in "Unseen Films," a series of Film Love events reflecting on the ways in which films remain unseen. Empire takes place almost entirely in the dark of night, outlasts most attempts to view it in whole, and is technically difficult to project. All these elements make it seem a film designed to not be seen. Over the years of rumor and unavailability, this un-seen-ness has itself become an integral part of Empire. Thus, instead of projecting Empire on its anniversary, we will hold an event that commemorates its filming, and its absence. Beginning at 8:10 pm – approximately the time Warhol began filming – we will meet underneath Mint Gallery's skylight. Curator Andy Ditzler will host a discussion and present research related to Empire. Our special guests are Stephen Fenton and Lance Ledbetter (of Dust-To-Digital recordings), who will discuss the experience of projecting Empire in its entirety in Atlanta in 1999. As with the original filming, we will gather in a room as the sky darkens, to focus on the activities of Andy Warhol, absence, darkness, Empire, and empire. FIFTY YEARS OF EMPIRE, PART ONE: ABSENCE OF EMPIRE is a Film Love event, programmed and hosted by Andy Ditzler for Frequent Small Meals. Film Love screens great but rarely seen films and promotes awareness of the rich history of experimental and avant-garde film. Through public screenings and events, Film Love preserves the communal viewing experience, provides space for the discussion of film as art, and explores alternative forms of moving image projection and viewing. Film Love was voted Best Film Series in Atlanta by the critics of Creative Loafing in 2006, and was featured in Atlanta Magazine's Best of Atlanta 2009.